To provide a broader perspective on suicide, this chapter has drawn on knowledge from the areas of suicide risk assessment in general psychiatry and consultation liaison psychiatry. Epidemiology of suicide and contextual factors are mentioned briefly to set the scene. 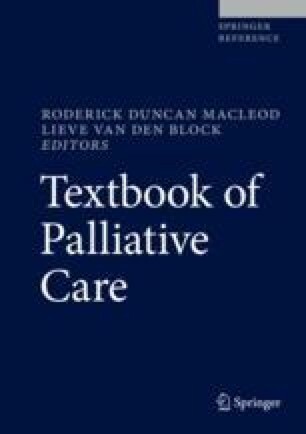 A framework to assess and manage the suicidal patient is described in some detail, to assist the palliative care clinician. This is followed by a description of the key issues involved in the care of a psychiatric patient within the palliative care context. The latter part of the chapter elaborates on the experiences of those bereaved after a suicide. The impact of suicide on clinicians is explored, as well as strategies to manage the distress that can ensue. The chapter ends with a discussion of the unspoken issue of physician suicide. Terms such as mental illness, psychiatric illness, and psychiatric disorder will be used interchangeably. Specific aspects of management of underlying psychiatric disorders are detailed in the Chap. 85, “Distinguishing and Managing Severe Psychological and Psychiatric Distress” (authored by Ms. Jane Fletcher and Dr. Di Clifton). Acute non-suicidal self-harm (previously termed parasuicide), chronic suicidal ideation, chronic self-harm, and suicide in special populations, e.g., adolescents, have been excluded from the chapter. Requests for a hastened death, physician-assisted suicide, and euthanasia have been detailed in the chapter 90, “Request for Assisted Suicide” (authored by Dr. Diamond, Dr. Khurana, and Prof Quill).